Galway East Tourism - EdMar B&B in East Galway, West of Ireland.Galway East Tourism - EdMar B&B in East Galway, West of Ireland. A very welcoming B&B in north Co. Galway. Ideal base for walking, golf, angling and much more. Welcome to EdMar Bed & Breakfast in Williamstown, County Galway. 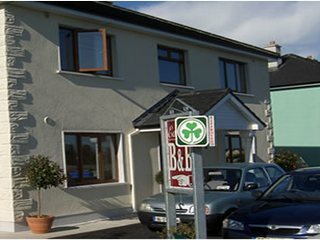 EdMar B&B is situated in the northeast tip of Galway County, in the picturesque village of Williamstown. We are also close to Roscommon, Mayo, Longford and Sligo Counties. Williamstown is an attractive rural village and locals take great pride in the appearance. Places of interest around Williamstown include a nature trail, Corralough Lake, a bog walk, holy wells at Templetoughter and Beaugh, and many ringforts throughout Williamstown. Activities include fishing , walking and hiking. When you check in to EdMar Bed and Breakfast you will be given a warm Irish welcome, a comfortable bed for the night, and a delicious home-cooked breakfast. All the comforts of home?away from home.